Today is World Digestive Health Day! To celebrate, I’ve got an amazingly delicious healthy pizza recipe for you. Enjoy my High Fibre Plant based Rainbow Chia Pizza! Healthy pizza is not a myth! To assist your digestion to function optimally, we want a diet high in fibre to keep things moving along your digestive tract. Traditionally, pizza is very low in fibre and high in fat (which can also cause digestive issues!). Lucky for you I’ve got a delicious health pizza recipe. My Rainbow Chia Pizza is the opposite! It’s the perfect digestive option (and weight loss option too!) as it’s packed full of fibre from ingredients such as chia seeds, psyllium husk, chickpeas and other vegetables to keep you feeling full for hours afterwards. The rainbow of veggies form a super tasty topping option that’ll have you reaching for more and more! 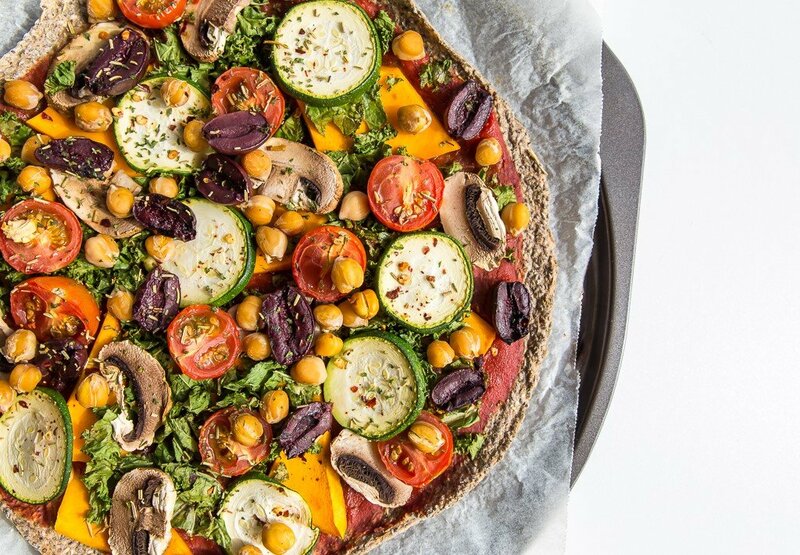 After you make my Rainbow Chia Pizza, you’ll be a healthy pizza convert! Make sure you leave me a comment to tell me what you thought of my healthy pizza recipe! Pre heat oven to 180 degrees celsius. To make the base, pour all the dry base ingredients into a large mixing bowl and stir. Add the water and continue mixing until a thick dough forms. Spread the dough evenly over the baking paper on the pizza tray until a round base is formed. Aim for the base to be about 1cm deep. Place the dough in the oven to bake for roughly 30-40 minutes or until it begins to firm up and brown. Pull the base out of the oven and spread with the tomato paste. Add all the vegetables then top with dried herbs plus salt and pepper to taste. Place back into the oven to bake for roughly 15 minutes or until the vegetables are cooked through. Remove from oven and allow to cool for 5 minutes before serving. Optional additions to serve the pizza with include: nutritional yeast, vegan cheese or standard cheese if you can tolerate it.